Crypto for beginners: What is cryptocurrency? A cryptocurrency is a digital or virtual currency that uses cryptography for security. It has no physical form and is not redeemable in another commodity like gold. The first cryptocurrency to capture the public attention was Bitcoin , which was launched in 2009 by an individual or group known under the pseudonym Satoshi Nakamoto . Today cryptocurrencies have become a global phenomenon known to most people. 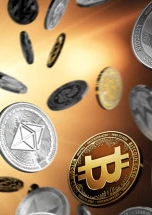 The anonymous nature of cryptocurrency transactions makes them well-suited for a host of nefarious activities, such as money laundering and tax evasion. Its supply is not determined by any central bank or authority and the network is completely decentralised. Cryptocurrencies use decentralized controls as opposed to centralized electronic money and central banking systems. The decentralized control of each cryptocurrency works through a blockchain, which is a public transaction database, functioning as a distributed ledger. It uses cryptography to secure and verify transactions as well as to control the creation of new units of a particular cryptocurrency . Essentially, cryptocurrencies are limited entries in a database that no one can change unless specific conditions are fulfilled. Mining refers to processing cryptocurrency transactions. Miners are the single most important part of any cryptocurrency network, and much like trading, mining is an investment. Essentially, miners are providing a bookkeeping service for their respective communities. Mining is open source so that anyone can participate and confirm the transaction. It needs a computer and a special program, which helps miners compete with their peers in solving complicated mathematical problems . This would need huge computer resources. In regular intervals, miners would attempt to solve a block having the transaction data using cryptographic hash functions . Cryptocurrency is an application of blockchain . Each record or series of records on the blockchain is known as a block. Blocks are data structures that mainly contain a set of transactions that have been performed in the system. Blockchain is a technology that has a certain number of records in a block, and this block becomes a stack in form of chain. A block is sent to the network and added to the blockchain after it's accepted by the network as a valid transfer. Once verified, the blocks cannot be changed. Every time that a block containing a specific transaction is included in the blockchain such transaction is said to be a confirmed transaction, since it has been already included in the blockchain and can be checked for doublespending prevention. Cryptocurrency Mining includes two functions, namely: adding transactions to the blockchain (securing and verifying) and also releasing new currency. P2P networks are the mechanism used by cryptocurrencies to disseminate system information while keeping the whole system as much decentralized as possible. Every peer has a record of the complete history of all transactions and thus of the balance of every account. The main goals of such network are, firstly, to allow members of the network to synchronize their view of the system state and, secondly, to disseminate peer information in order to allow peers to re-enter the system after a disconnection. Adding a block to the blockchain is known as the mining process , a process that is also distributed and that can be performed by any user of the Cryptocurrency network using specific-purpose software (and hardware). Only miners can confirm transactions. This is their job in a cryptocurrency-network . They take transactions, stamp them as legit and spread them in the network. After a transaction is confirmed by a miner, every node has to add it to its database. It has become part of the blockchain. As more people join the Cryptocurrency rush, your choice could get more difficult to mine because more expensive hardware will be required to discover coins. By solving a complex mathematical puzzle that is part of the Cryptocurrency program, and including the answer in the block. The puzzle that needs solving is to find a number that, when combined with the data in the block and passed through a hash function, produces a result that is within a certain range. A hash is a simple way to represent a large amount of data in a compact and unique way. The hash function makes it impossible to predict what the output will be. So, miners guess the mystery number and apply the hash function to the combination of that guessed number and the data in the block. The resulting hash has to start with a pre-established number of zeroes. Miners keep iterating through a part of the hashed data called a nonce in order to see if they can get a hash number which has the requisite number of leading zeros in it. There's no way of knowing which number will work, because two consecutive integers will give wildly varying results. The first miner to get a resulting hash within the desired range announces its victory to the rest of the network. All the other miners immediately stop work on that block and start trying to figure out the mystery number for the next one. As a reward for its work, the victorious miner gets some new Cryptocurrency . Confirmation is a critical concept in cryptocurrencies . You could say that cryptocurrencies are all about confirmation. If your transaction is unconfirmed for hours, just wait. If more than 72 hours pass and your transaction still isn't confirmed, you can re-send the transaction . As long as a transaction is unconfirmed, it is pending and can be forged. When a transaction is confirmed, it is set in stone. It is no longer forgeable, it can't be reversed, it is part of an immutable record of historical transactions: of the so-called blockchain. Roughly every ten minutes, a new block is created and added to the blockchain through the mining process .